This sauce is named for what one cookbook I read politely referred to as “women of the night.” Why? It’s cheap, quick and easy. It’s a sauce with strong flavours, but it can easily be modified to your taste. For less salt cut back on the capers and for more heat increase the chili flakes. You can also take your pick of olives and tomatoes. I’ve always used sliced black olives, but Nicoise or Kalamata would be delicious too, just make sure there are no pits involved. If you prefer a thicker sauce, use crushed tomatoes or buy whole plum tomatoes and give them a good squishing (it’s a great job for kids who want to help cook). For a lighter and fresher sauce, diced tomatoes work better. There’s no salt added to the sauce and that’s not an oversight. The briny capers and salty anchovies give it more than enough sodium. One final tip, to turn this into a meal, it’s easy to poach a thin cod fillet or egg in the sauce as it cooks. Or you can simply add a can of tuna, drained, when the sauce is just about ready. Ingredients for Puttanesca Sauce, clockwise from top left: Olive oil, parsley, canned tomatoes, black olives, oregano, garlic, chili pepper, capers and anchovies. Fill large pot with water. Bring to a boil, add salt and stir in pasta. Cook according to package directions until al dente. In a separate pan, heat olive oil on medium heat and add chopped garlic and anchovies. Sautee until garlic is golden. Turn heat to high, add tomatoes and bring to a boil. Once at a full boil add the oregano, chili flakes, capers, black olives and parsley. Stir frequently. 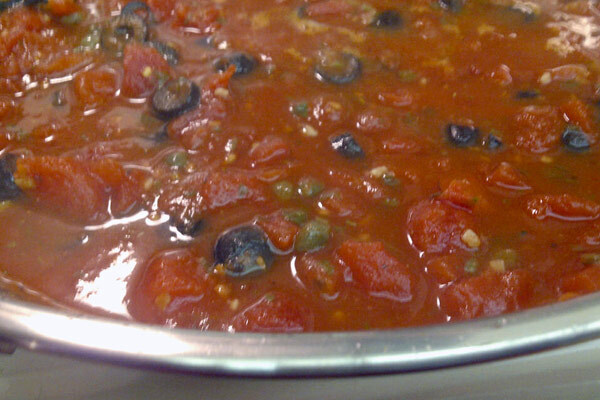 Reduce the heat slightly and continue to simmer until the sauce has thickened to your liking. Drain pasta when ready and combine with a few ladles of sauce. Plate pasta and top with more sauce. Garnish with additional chopped parsley. 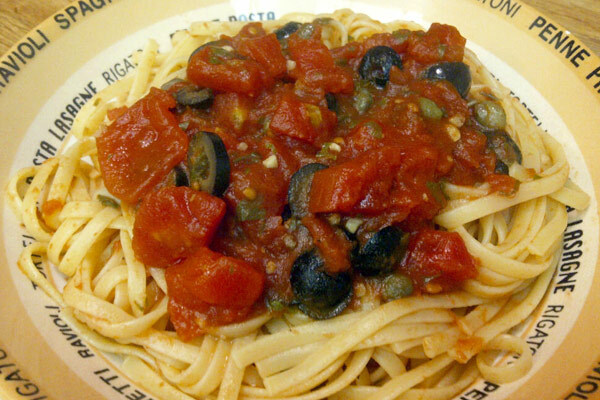 Cook your Puttanesca Sauce longer for a thicker consistency. 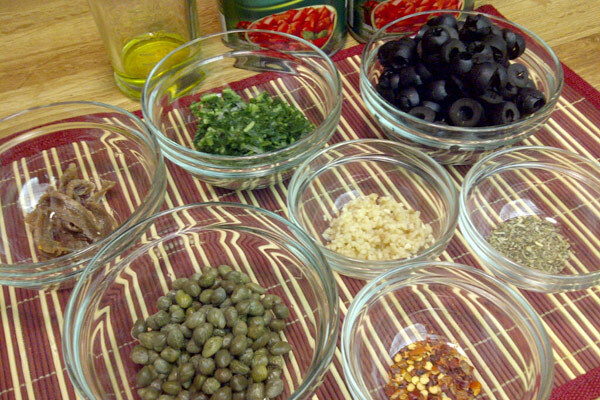 Watch CTV Southwestern Ontario at noon on Friday, March 2 to watch me prepare the dish live! I’ll post a link to the video when it’s ready. Amanda, Congratulations!! on your TV Debut!! You looked amazing and the recipe was very well presented!! I will definitely want to try this recipe!! Looking forward to seeing you again on “Cooks of CTV”. Very proud of you!! What a great presentation! I saw you on ctv news too and you were amazing. Your video was fresh, well organized and interesting. I wanted to hear more from you when you were finished. You have the personality that appeals to anyone who is looking for quality as well as a good deal. The pictures you provided are colourful and the text completes all the details we want to get from your writing. Well done! !